Starting Off on the Right foot…Well the Front Foot Anyway! Home / Golf Instruction KH / Starting Off on the Right foot…Well the Front Foot Anyway! One of the things that I see in students who I teach is they never have enough of their weight forward when the set up to the golf ball at address. 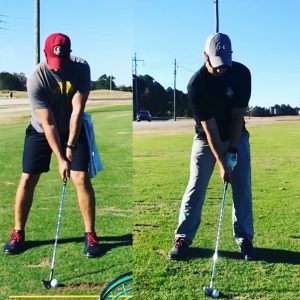 So many times when doing private lessons with my students, they come to me wanting to get rid of a slice or to the want to stop hitting the “Fat” shot. Both of these problems are easily accomplished by just setting up with the right weight distribution of 55% on the front foot and 45% on the back foot at address. 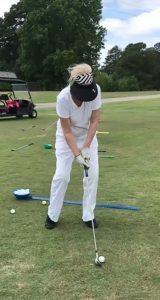 By starting off on the right foot so-to-speak, having your weight forward, you dramatically increase the likelihood that you will hit the ground in front of the golf ball, thus eliminating the dreaded “Fat” shot. 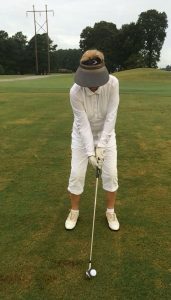 Additionally, the longer you keep your weight forward the longer the club travels outward and the more you increase the chances that you will hit a draw!